On February 13th, Charna Halpern, co-founder and owner of famed Chicago improv theater iO, announced that she was shutting down that theater’s Los Angeles location, iO West. The theater was struggling financially, she told Splitsider, citing “a club the landlord put in next door that had shootings and fights constantly,” and bands that “rehearsed under our stages” which the landlord “put in” after the club closed. “Students and theatergoers decreased” irrecoverably under these conditions, said Halpern, who with Del Close invented long-form improv as we know it today. The theater was behind on three months’ rent; it would close eleven days later, on February 24th. The announcement sparked an outpouring of emotion in the Los Angeles comedy community. There was sadness over the sudden loss of a beloved artistic home, one that in its 24 years served as a training ground for multiple generations of comedians. And there was intense anger among some of the theater’s staffers and performers, current and past, toward the woman whose leadership was rocked by contempt, conflict and even outright scandal. These emotions were closely linked, as community members’ surprise at iO West’s shuttering and their gratitude for what it gave them—friends, partners, careers, a place simply to do and see what they love—morphed into bitterness that they were given no chance to save it. For many, this bitterness was long-simmering. It catalyzed a deep, widespread feeling that Halpern never really cared about iO West or the artists who called it home; that the theater thrived, when it thrived, in spite of her, not because of her; and that her rarified position in the comedy world, one that includes a direct line to Lorne Michaels and his casting directors, has come at the cost of abusive working conditions and possible violations of law. Interviews with over a dozen members of the iO West community, including former employees with direct experience of Halpern’s leadership, reveal a style defined simultaneously by micromanagement and neglect. Sources tell of a strained, tempestuous relationship between iO West and its management in Chicago—Halpern and her former longtime business partner, Mike Click—who showed little trust in the theater’s ability to chart its own course. This mistrust reverberated across every aspect of the theater’s activities. Relatively minor operational decisions, such as equipment purchases and marketing strategy, generally required Chicago’s approval, which was often withheld. Halpern dictated erratic programming and staffing decisions from Chicago, often disregarding the objections of employees on the ground. When the results displeased her, she was known to unleash her wrath at whoever picked up the phone, full-time staffers and unpaid interns alike. Halpern’s handling of the Grace allegations unleashed a wave of public criticism and drove some performers away from the theater, eroding the community’s already tenuous trust in her leadership. But it did not shut iO West’s doors. That happened almost two years later, after a closing party Halpern attended against the protestations of many students and performers, and as the result of factors many years in the making. Cowhig was far from the only employee to meet stern resistance toward routine requests. “No” seemed to be an operative word at iO West, an irony that is not lost on practitioners of a form, invented by Halpern, whose central tenet is saying yes. Debbie Friedman started working at iO West around 2012, first as an office assistant and later as an assistant in the training center. She describes the office environment as a stressful one. “By the time I came in, it seemed as though James had just been browbeaten by Charna for so long that he was very negative about the prospects of improving the theater, and he was very negative about everything,” she says. She was one of three paid office employees at the time. Many of the theater’s operations were run by students working in exchange for classes, which meant there was little institutional cohesion. Every day the box office would be staffed by a different intern; the theater’s marketing strategy, dictated over email by Grace and Halpern, essentially comprised interns posting on social media; broken flats and railings would be repaired by unpaid, unskilled laborers motivated by love for an organization that rarely returned it. This was not the first time tension arose between Spellings and iO’s leadership, whom he says treated iO West with general disregard: “We were always sort of lesser-than.” During an improv festival a few years earlier, he and Halpern were approached by a fire marshal who informed them that the event was over capacity. Halpern moved to deal with the situation, Spellings recalls, and “Whatever she said to him was just so acerbic that the guy immediately snapped and said all right, you’re done, we’re shutting the place down.” He intervened, and within 15 minutes cleared enough people out of the theater that the fire marshal relented. The Aloha situation, however, was the last straw. Early the next morning he went into the office, made copies of all his time sheets—in case he decided to sue over failures to pay overtime and provide legally-mandated breaks—and gave notice to Click. He did not end up filing suit, fearing that if authorities investigated iO West over what he describes as widespread violations, Halpern might shut down the theater, robbing his friends and colleagues of their livelihoods and artistic home. He was succeeded as bar manager by Brian James O’Connell. By his third firing, O’Connell had had enough. He stayed on as a bartender—his rent wasn’t going to pay itself—and was careful not to mention The Pack, or even wear his Pack sweatshirt, while he was on iO West’s premises. “I didn’t want anyone to have any excuse at any time to say that I was being untoward, or that now that I was bitter, now that I’ve been fired, that I’m actually trying to steal students,” he says. 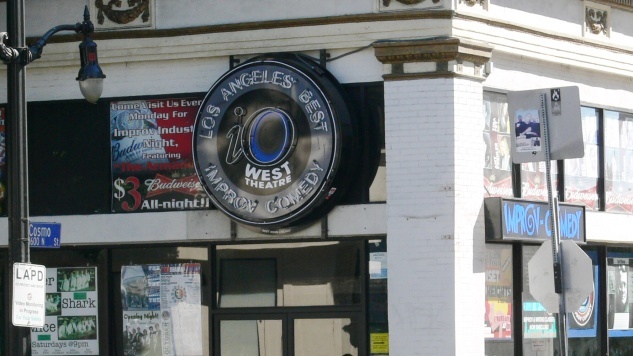 After iO West shut down, The Pack was one of several LA comedy theaters that announced it would provide free and discounted classes to iO West interns and students. Halpern and Click treated iO West’s employees and performers with dismissiveness that often erupted into disdain. Their obsession with the bar above all else, and Halpern’s peculiar insistence on dictating teaching appointments she ultimately forgot about, belie a greater failure to understand ground-level realities in Los Angeles. When iO West temporarily closed after the 2008 drunk driving incident that demolished its storefront and damaged its bar, James Grace enlisted John Conroy, a communications professional and performer at the theater, to help strategize the reopening. Conroy drew up two detailed proposals. One outlined plans for a splashy opening event, complete with celebrity appearances, to draw the attention of local and national media; his understanding was that the theater’s insurance payout for the accident included an allocation for such an event, which Halpern denied in emailed comments to Paste. The other proposal outlined a long-term marketing and PR strategy designed to put iO West in serious competition with UCB and Groundlings, which enjoyed disproportionate name recognition and attendance compared to iO. Conroy estimates his advice, which he happily volunteered, was worth approximately $12,000. One iO West performer who won the rare prize of a “yes” from management is Gina Ippolito. In 2013 she sought James Grace’s permission to beef up the theater’s sketch program, which at the time was deeply disorganized. Sketch teams had no devoted time slots, making it difficult for any one team to build an audience, and some teams wouldn’t even show up for their sets. With Grace’s blessing, Ippolito implemented a number of changes to the Sunday sketch night. Working for free, she assigned consistent time slots to each team, encouraged performers to promote their shows, placed ads in online publications, organized mixers for the theater’s sketch community and put together its sketch festivals. In other words, she did all the work of a producer for none of the pay, not that she asked for any—she just wanted to build an audience and community on par with the work. Ippolito estimates that after a couple years of these efforts, she had tripled the sketch night’s attendance, a dramatic enough increase that a second bartender was added to handle the load. By every metric the effort was a success. Over time, Ippolito came to suspect Halpern and Grace had realized there was money to be made in what she’d built. This turned out not to be a good thing. “At some point there were just too many teams,” she says. “The product itself was watered down and a lot of people felt, maybe this is just a cash grab for them so they don’t have to really put any work into it.” iO West had three theaters: the Main Stage, The Loft above it and the Del Close Theater behind it. As sketch shows were added, long-running sellout shows were put in competition with newer shows scheduled at the same time in a neighboring space. As a result, sellout shows stopped selling out; neophyte teams risked alienating new and returning customers alike. Ippolito asked Grace, who she says rarely attended sketch shows, if they could scale back. “He said sure, we can definitely do that. And then he added even more teams after talking to Charna.” (James Grace declined multiple requests for comment on this story). It was an exasperating contradiction—they weren’t doing enough to promote their shows, which they shouldn’t need to promote—compounded by Halpern’s continued reluctance to invest in marketing. Sketch teams were responsible for their own promotional efforts, which generally amounted to contacting news outlets and posting on social media. Ippolito and her fellow performers would brainstorm more elaborate approaches, such as visiting a local hostel with flyers that offered free drink tickets. “Everything was, ‘Well we need to contact Chicago first,” she says. “And then Charna would always say, ‘You shouldn’t have to do this. They should just be coming in off the street.’ She wasn’t willing to put any time or money into the theater.” Alternately, she might approve a request in person, then email Grace “as an afterthought” reversing the decision. An exception to this rule came in 2014, when Halpern approved approximately $1,300 in funding for a new camera and microphone to record iO West shows. Grace announced the news in an email with the subject line “Miracles can happen! !”, signifying the rarity of Halpern’s blessing. She didn’t end up providing the funds, however, as a live-streaming company called Gigity.TV offered to donate the equipment under the condition that they would host the video. Ippolito says the donated camera eventually stopped working; it was never replaced. It is not uncommon for a small theater to run on a shoestring budget. It is also not uncommon, though not quite as justifiable, for a comedy theater to depend largely on the cheap or unpaid labor of young adults early in their careers. What stands out about iO West isn’t simply Halpern’s stinginess or her indifference toward the community, but that she appeared to be a wholly different person when it came to iO Chicago. In 2014 she took out a loan of approximately $7 million to purchase and renovate a new building for her flagship theater. The new complex included an event space, a beer garden, classrooms and a kitchen, according to the Chicago Tribune. In 2016, she told Inc. that iO’s business had tripled since she bought the space, and that despite certain challenges it was profitable. Contemporaneous emails, reviewed by Paste, indicate that iO West was suffering dire financial constraints in that same period. In one April 2016 exchange over cuts to the theater’s security personnel, Halpern asked that an employee stop questioning her decisions and instead “help and start a search for a new space[ ]or recruit students.” Interns were put on door duty, as they had been during Maria Felix’s time at the theater a few years earlier, until staff discontent reached a breaking point. “It took people threatening to walk out for her to actually get security,” says Jon Crowley, a longtime bartender at the theater. “She just wanted an intern to work the door. So I’d have a nice kid who’s 5”5’, 90 pounds working the door, and he’s a nice guy but it’s not his job to throw out a guy on crack. He was just an unpaid intern put in danger.” This was two years after Halpern borrowed $7 million for the Chicago theater, and just shy of two years before she closed iO West after failing to pay three months’ rent—a failure she insists she was not aware of until after the fact. Halpern is a foundational figure in modern comedy. She created long-form improv; she trained and mentored the likes of Tina Fey and Amy Poehler; she still hand-picks comedians for Saturday Night Live auditions. She may not have considered it at the time, but her words carried great weight and would have far-reaching ramifications. “Charna’s mishandling of sexual assault reports and sexual harassment, and a lot of problematic statements that she had made online, made a few people step back in general,” says Ippolito. Halpern’s former employees have also accused her and Mike Click of systemic wage theft. A range of former iO West bartenders, servers and tech personnel tell Paste that they were regularly denied overtime pay for shifts exceeding eight hours. All were hourly employees; many worked for minimum wage. Britain Spellings, the theater’s bar manager from 2001 until 2006, says he worked overtime at every comedy festival during his tenure. “They wouldn’t pay me overtime even though I would submit for it,” he says. Lauren Miller, a former bartender, server and performer who spent eleven years at the theater, says that employees were given neither overtime nor meal breaks, which California law guarantees to employees who work more than five hours in a day. “Neither of those existed,” she wrote in emailed comments to Paste. “Some nights, if a 5 p.m. SNL showcase was added or a class show, the bartenders/servers would have to get there as early as four or 4:30 p.m. and then you just worked a regular night straight through. People would bring food with them and snack as best they could, but there were no meal breaks and we all just made our hourly wage regardless of how long the shift ended up being.” On most nights, the theater’s final performance was at 11 p.m. Employees might stay until after midnight closing up. The alleged violations continued, however, even after Click departed iO in early 2017. Sean Cowhig, the former technical director who stayed on as a bartender until the theater closed, says he was denied overtime as recently as this past February. “I worked over 8 hours this month on Super Bowl Sunday as a bartender,” he wrote in emailed comments to Paste. He did not receive overtime, he says, because the theater’s policy was to pay overtime only when employees worked more than 40 hours in a week. When Paste asked whether Sean Cowhig worked overtime last February, Halpern said Brandon Sornberger, iO West’s bar manager at the time, confirmed the hours. “Brandon told me sean did Work an extra two hours for Super Bowl,” she wrote in an email to Paste. “Brandon always submitted the hours as weekly hours which were paid and didn’t realize we had to know it was overtime. It was never done intentionally.” She added that iO would send Cowhig a check for time and a half for those hours. Asked to confirm Halpern’s version of events, Sornberger declined to comment. Here is the point that I think you can clearly see now. There are some people who are so angry that they are going to the press and want to cause trouble for me purely because I lost my business. Its really unbelievable. Here are the facts. Sean has worked for me for years and is so angry I closed that he went to the press because, even tho he was paid for those 2 extra hours bartending for Super Bowl, he didnt get the extra $15 for time and a half. (Which was a mistake as Brandon put it in his weekly hours) We rarely get overtime so he didn’t know. And Mike Besaw worked for me in 2016. We never had ONE complaint as all his hours were paid for his less than 40 hour work week. But NOW he is going to the press. We are going to look at his records to see what he is owed once our Aloha system gets shipped from LA. What amazes me is the way some of these folks are behaving. Not all, thank goodness. Just a few. Most have been appreciative of the 20 years they had and the amazing community that I built. But there are a few who are behaving in a most confusing manner. If someone would have cancer, you would say you’re sorry. You wouldn’t get mad at them. If someone loses their business, you say your sorry-you don’t get angry and go to the press for $15 . Ive never experienced anything like this. There are many in the community who have apologized for the way others have been acting.They are just as surprised. I guess people handle grief in different ways. Paste explained that Cowhig’s shift was one of many, he’s alleged, for which he did not receive overtime. Paste also explained that for much of Besaw’s employment, he was not aware that California law guaranteed overtime for shifts over eight hours regardless of the total hours worked in a week. Halpern did not respond. Halpern declined to respond to questions about iO West’s marketing strategy or chain of command. Asked about complaints that she frequently refused to finance equipment upgrades and other operational necessities, she wrote, “There are some very angry people and a great deal of misinformation flying around… Theres so much crazy stuff being written and its frustrating because I don’t have the time or inclination to answer all this.” She added that students would be refunded the cost of cancelled classes; interns who had worked in exchange for class hours would be compensated as well. She said she would be happy to allow iO West alumni free admission to iO Chicago shows. Nearly every member of the iO West community who spoke with Paste stressed that they are not angry about the simple fact of the theater’s closing, but that Halpern handled its closure with the same indifference that defined her leadership for almost 20 years. Former performers and employees lamented that they were given only eleven days’ notice, and decried Halpern’s social media posts dismissing them as “young folks” with “misplaced anger.” More than anything else, the comedians Paste spoke to were disappointed that Halpern never seemed to recognize how much they truly cared about iO West—how much they had invested when she declined to—and what an asset their passion could be. Charna Halpern entered iO West on February 24th, a brisk day in Los Angeles, in a manner familiar to everyone inside: angry. “She came walking in and she started yelling at everybody,” says Mike Besaw. “She yelled at Brandon [Sornberger], the bar manager, and Colleen [Doyle, co-artistic director], who worked in the office, and she yelled at me. Why isn’t there security here? Because you didn’t want to pay for it, that’s why they’re not here yet.” The final show began at 8 p.m., the closing party began at 9:30 p.m. In a speech, Halpern thrice referred to Jon Crowley, her bartender of 13 years, as “Kevin.” By 10 p.m., a line stretched around the corner. The space was dense with bodies, from the bar to the theater behind it and upstairs into the loft. Groups of performers shot their final photos on the stage they’d long called home. They leaned against old, cracked barstools and shouted over the din. Across the street, at a bar called Scum & Villainy Cantina, another party raged: the “rebel party,” as one comedian described it, for those who left iO West years ago and those who wished to celebrate iO West without giving Halpern the satisfaction of their presence. They didn’t have to wonder what the L.A. improv community would look like in her absence; they had already built it without her. And now they would build something new. An earlier version of this story stated that Debbie Friedman was one of three paid staffers at iO West at the time of her employment. It has been updated to reflect that this number referred to office staff, not total staff.